With Amazon missing Wall Street’s profit estimates for Q4 2013, supposedly its most profitable quarter, there is a possibility that Amazon Prime could increase by $20-$40 from its current $79 annual fee. There are questions as to whether this would kill Amazon Prime (although this is probably just link bait) and discourage current and future Primers. These are my thoughts. As a Primer, I have enjoyed the benefits of the subscription program. It’s not just the fast 2-day shipping that can save me whether it’s during the holiday rush or buying baby supplies on the fly. I have also benefited from the Kindle Owner’s Lending Library and Prime Instant Video, the content of which were ramped up by Amazon to compete against Netflix. But forget about me, what I’d like to ask is this: what is/are the alternative/s to Amazon Prime currently in place? If Amazon were to jack up the Prime membership price, would the switching costs be high enough for me to stick it out and pay? Let me answer by sharing a recent buy from Amazon – a Danby 7.0 cu. ft. chest freezer, worth $344.23. This thing weighs 101.5 pounds and it happens to be eligible for Amazon Prime. A freight company delivered it right into my kitchen. What were my alternatives? 1. Pick it up in-store which would entail driving at least 5 miles to the nearest store, park, look for the freezer, talk to a salesperson, wait for someone to take to the car, drive back and unload to the kitchen. Or I can have it delivered several days later – for an added fee, of course. Time investment: at least 1.5 hours. Home Depot. It is less expensive than Amazon but shipping *starts* at $75.00 to total at $354 – $10 more than Amazon. Sears. 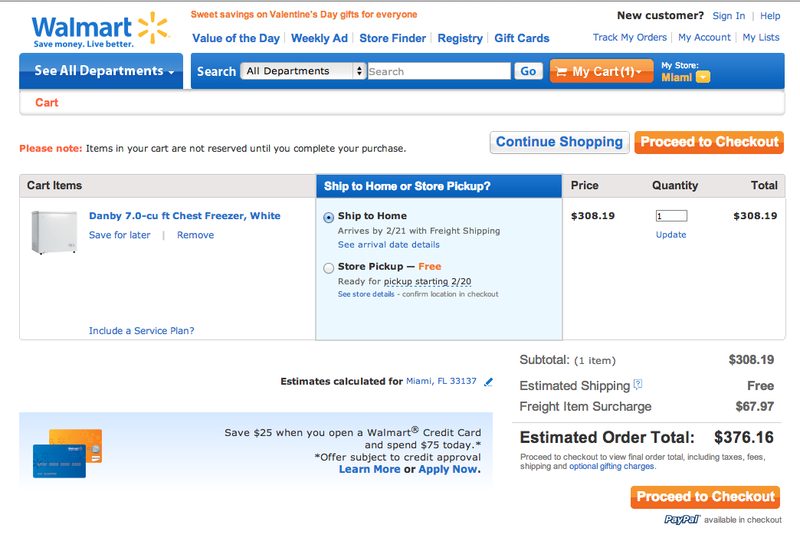 Shipping costs are actually not bad at $5.99 but the freezer retails at $409.44. Walmart. 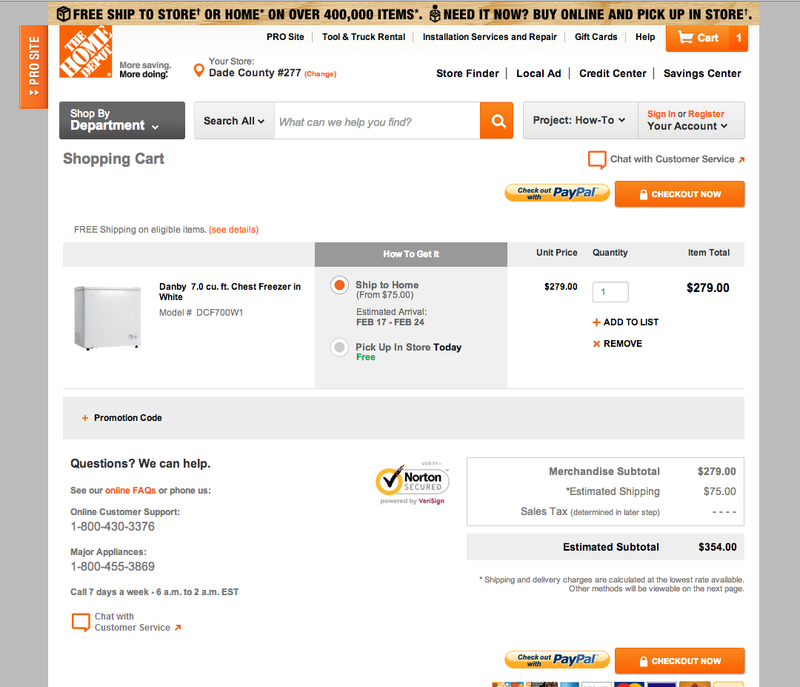 For a store known for steep discounts and competitive pricing, the freezer does retail for only $308.19 and “free shipping” but adds a “freight item surcharge” of $67.97 for a total of $376.16. Seeing these options, I’m sold on Amazon Prime just from considering option 1. I’m not even touching on the fact that for all the online buying options, delivery time averages 10 days. I think I’ll be willing to pay that $20-$40 increase after all. I’m not going to begrudge Amazon of capitalizing on that consumer surplus.